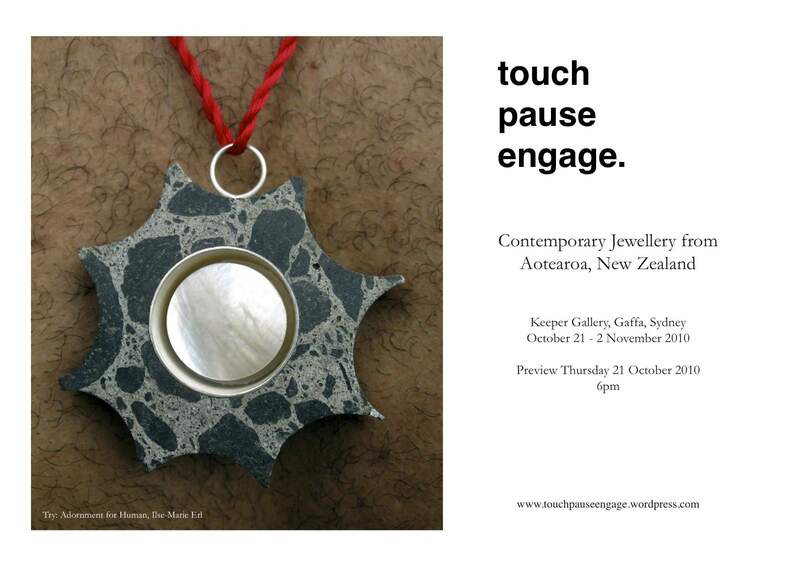 Touch, Pause, Engage is an introductory snapshot of contemporary jewellery from Aotearoa, New Zealand for the Australian community. Known primarily as the call the referee shouts before two rugby teams lock into a scrum, in this context Touch, Pause, Engage becomes a call to look fully and interact with jewellery as you see it. And so, this innovative jewellery showcase is designed to reset the trans-Tasman rivalry between our rugby-loving brothers and sisters, and to build new jewellery relationships. The show will be hung at the Keeper Gallery, at the Gaffa Art Complex in Sydney, and will run from 21 October – 2 November 2010. Opening night, October 21st will also mark the release of an accompanying publication. The initiative of Kristin D’Agostino and Raewyn Walsh, Touch, Pause, Engage, has invited a diverse team of fifteen New Zealand jewellers to submit inventive and inspired works. Although many of the makers’ practices focus on different issues and are expressed in a wide range of forms, the side is fit and game ready. The roster is comprised of talented individuals with varying skills, strengths, and experience but who all make a target of pushing the experimental aspects of their jewellery practice. This entry was posted in Touch Pause Engage on October 9, 2010 by kristindagostino.